Traditional shopping streets, called shotengai, are dying out all over Tokyo. A couple of very fine examples still exist, where locals are still doing their daily shopping. It is likely they will disappear forever though, or transform into merely touristic streets as is the case already at several places such as Shibamata. This street in Yanaka is in between these two. You clearly have a lot of tourists visiting this street, especially during the weekend. However, if you would visit around dusk on a weekday you see mostly local shoppers. When I was visiting on a weekday to get one of the famous meat croquets I stumbled upon a long line, but I was surprised to find that most people in the line were locals who just came to get their share of fried food for their evening meal (me, together with a tourist from Taiwan, were the only ones who just bought one item to eat at the spot). These traditional shopping streets are interesting as they sell items that you do not easily find anywhere else. 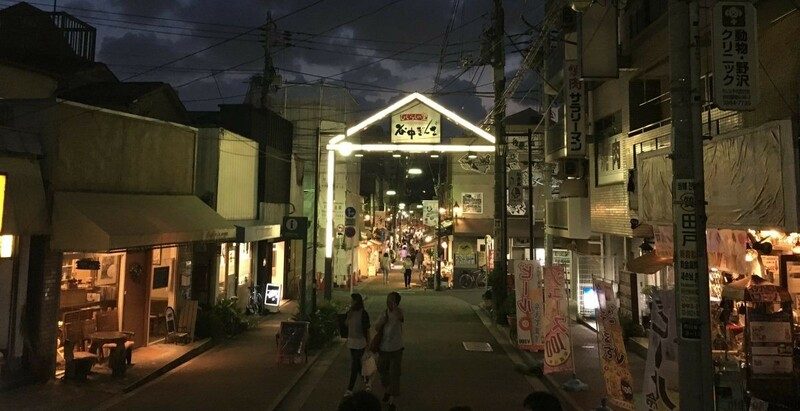 Yanaka Ginza is 175 meters long and is especially famous due to the atmosphere that brings you back to old times. It primarily attracts visitors from all over Japan (it has been featured in the Japanese media several times), but also receives more and more foreign visitors. As the stores caters to locals as much as tourists, there are no pushy vendors. It is a great place to buy reasonably-priced traditional souvenirs such as chopsticks, folding fans or Japanese sweets. While this street is being sometimes sold as an Edo-experience (Edo period was from 1603-1868), this street mainly has a distinct mid-20th century Showa feeling to it (Showa period was from 1926 to 1989) and appears to have formed in its current shape right after the Second World War. If you were wondering about the name “Ginza”, indeed it comes from the Ginza area in Tokyo. This is because in the olden days, as Ginza was the only “high street” in Japan, many other shopping streets added Ginza to their street name in order to emphasise their status. cats: when it is not so busy you can find them wandering around the street. Even if it is busy, you can spot the statues of the 7 lucky cats that are placed all along this shopping street in quite a life-like fashion. At first, I thought one of the cat statues that was placed on the roof of a store was actually real. a great view (yūyake dandan): there are stairs at the start of the shopping street (eastern side) where you can watch the sunset (yūyake means sunset, dandan means steps/stairs, the name was the result of a naming competition in 1990). It is a nice spot to watch the bustling shopping street day and night. It is only a 4.4 meter elevation, but it lets you definitely capture the street from a different perspective. Take out your camera! The promotion site of Yanaka Ginza (in Japanese only) list 60 shops on this street in 2018 (it was 65 in 2016). The type of shops are very diverse, from a butcher to a barber and shops that sell weaved baskets. You can find snacks, sweets, all sorts of clothing, but there are almost no chain stores, nor a single burger joint. It is interesting to note that there is no konbini (a Japanese convenience store such as lawson or 7/11) either. The only exception of a regular-type store is a 100 yen shop. Bamboo-crafts store: Midori-ya (info page in Japanese). All kinds of items such as chopsticks an baskets in bamboo. Open 11:00-18:00. Closed on Mondays. Custom Japanese seal store: Shinimonogurui (info page in Japanese). Get a funny Japanese seal (these are not the ones you can use officially, they are just some sort of gimmick). The seals they sell here have usually a drawing of an animal/person/thing and a couple of Japanese characters to make a certain point. Fun for kids. Some basics knowledge of Japanese required to get the joke. Open 12:00-18:00 (no holidays). Croquet store: Niku no Suzuki (info page in Japanese). They have cheap vegetable croquet from JPY 30 (without tax, price in 2016) that you can eat on the go, as well as a minced meat croquet (much more expensive). Apart from that they well all kinds of other fried foods and skewers (take out only, no photos allowed). Open 10:30-18:00. Closed on Monday (on Tuesday in case of holiday on Monday). Traditional wooden and straw-rope sandals store: Hamamatsuya (info page in Japanese). Japanese traditional footwear such as geta (a form of traditional footwear that resemble both clogs and flip-flops). Open 10:00-18:00 (in summer until 19:00). Closed on Monday (on Tuesday in case of holiday on Monday). Traditional tea store: Kanekichien (info page in Japanese). Store has been there for more than 50 years. All kinds of green tea, visitors will get some tea for free when you enter. Open 10:00-19:00. Closed on Wednesday. Taiyaki shaped-like-a-cat store: Maneki-ya (info page in Japanese). Taiyaki is a traditional sweet with anko-paste inside a fish shaped cookie-type shell (also other fillings are common nowadays). As we are in Yanaka, cat town, they come in the shape of a maneki-neko (luck charm cat). Open 11:00-18:00. Weekends and holidays until 18:30. Closed on Wednesdays. For more Taiyaki, check my page for the 5 best places for Taiyaki in Tokyo. Liquor store: Echigoya (info page in Japanese). In the street since shortly after the war when the shopping street was forming. Has a wide selection of local sake from all over Japan. White cat on roof. Open 10:00-21:00. Open until 20:00 on Sundays and holidays. Kimono store: Marufuji (info page in Japanese). All kinds of traditional kimonos and… very cute small cat toys. Open 10:00-19:30. On Sundays and holidays: 11:00-19:30. Closed on New Year’s Day. Japanese pottery/sweets store: Yuzuriha (info page in Japanese). All kinds of very colourful traditional pottery, and sweets! Open 10:00-19:00 (no holidays). This page was originally published on 22 September 2016. Latest update October 2018. Nippori Station – 1 minute walk (Yamanote line, Jōban Line, Keihin-Tohoku Line, Keisei main line and Nippori-Toneri Liner). Why visit? One of the few authentic shopping streets in Tokyo, where you can find shops specialised in certain items you cannot find anywhere. You have a great view from the stairs at yuyake dandan, and cats (live ones and 7 statues). A place to buy reasonably priced Japanese gifts and souvenirs. When to best visit? All year round is fine, best to visit on a weekday as it can get rather crowded during the weekend. 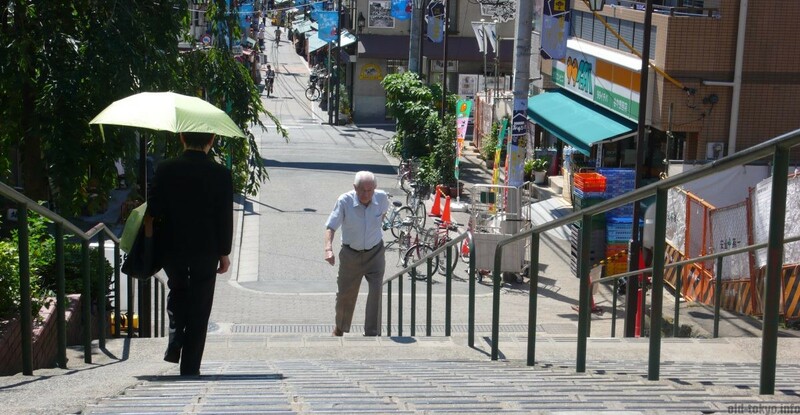 Going late afternoon is recommended so you can see the sunset from the stairs (yuyake dandan)! Places to visit or things to do in the area? Right in the Yanesen area.